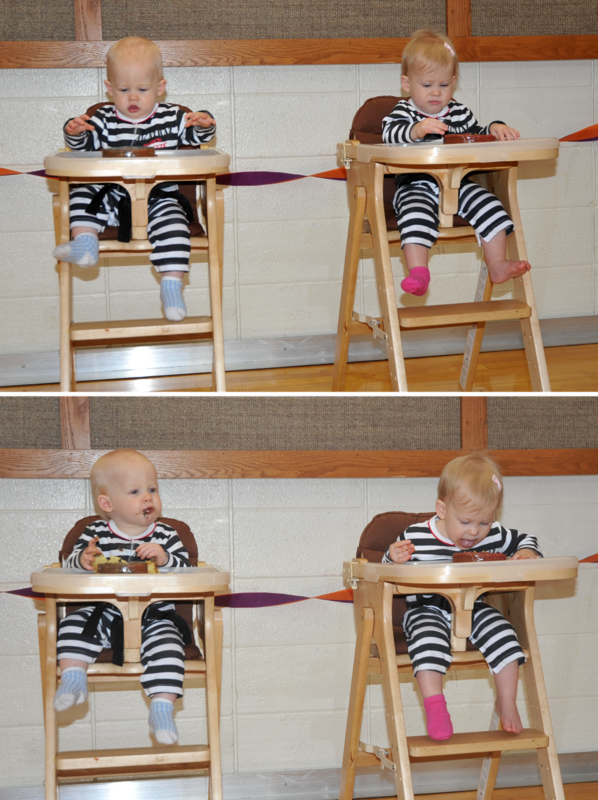 How do you tell the story of your child's first year of life? How do you explain each overwhelming emotion from happiness and elation, to harrowing sorrow and guilt? How do you add up the lack of sleep with a clock that just keeps ticking, all the while wondering if you are doing anything right? The gift of life is truly miraculous. This year has been amazing watching and reveling in all the human body is capable of. The growing and changing physical body beginning with pregnancy, the magnificence of the human brain, and the emotional heart that bonds us to one another is the most powerful combination of forces. It has been difficult for me to say goodbye to the moments when they laid on my chest sleeping side by side sharing heartbeats in tandem, or when they gazed into my eyes needing and wanting nothing other than the comfort and closeness of their mother. Though each new exploratory moment is precious, it is painful for me to realize that each day they are growing ever closer to losing that magical innocence they wholly possessed as a tiny baby. At the same time, witnessing their excitement at diving into a tub of cookie cutters, the constant giggles and the expression of learning something new everyday is phenomenally rewarding. It has been an incredible and momentous first year for both Gabriel and I as parents, and of course, for my (two) first born. 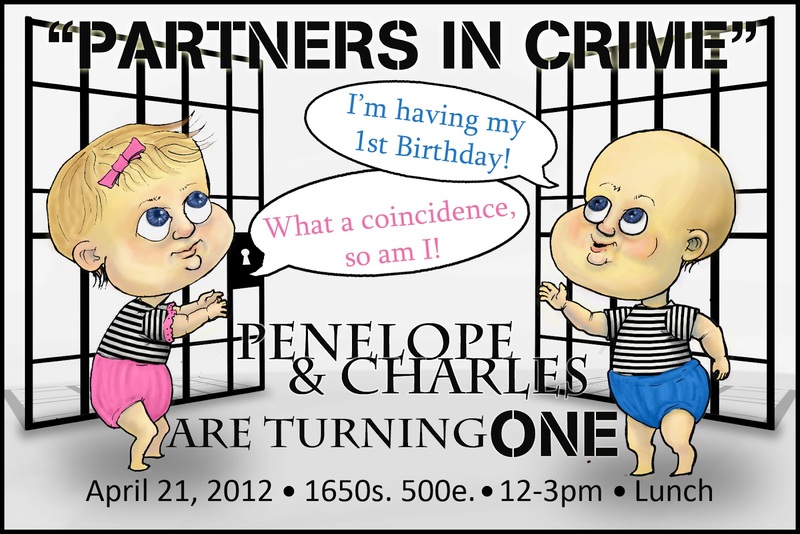 So, in celebration, we threw a huge party to commemorate the occasion. 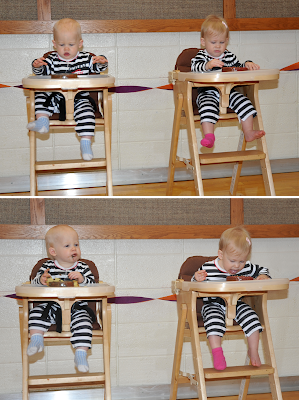 Because these two little ones are constantly propagating mischief together, the theme of the party was a no-brainer. 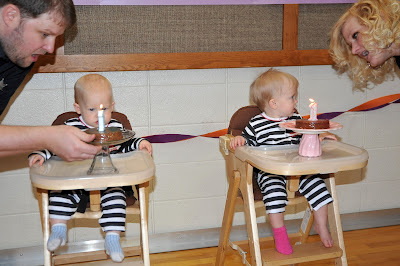 We fashioned their invitation after Elvis' famous Jailhouse Rock movie cover, and the theme continued throughout the party from decorations to games. We dressed our little hooligans in matching black and white striped inmate Alcatraz uniforms, and Gabriel and I wore sheriff badges as we welcomed everyone into the Sugarhood Penitentiary and ushered them into the jail. 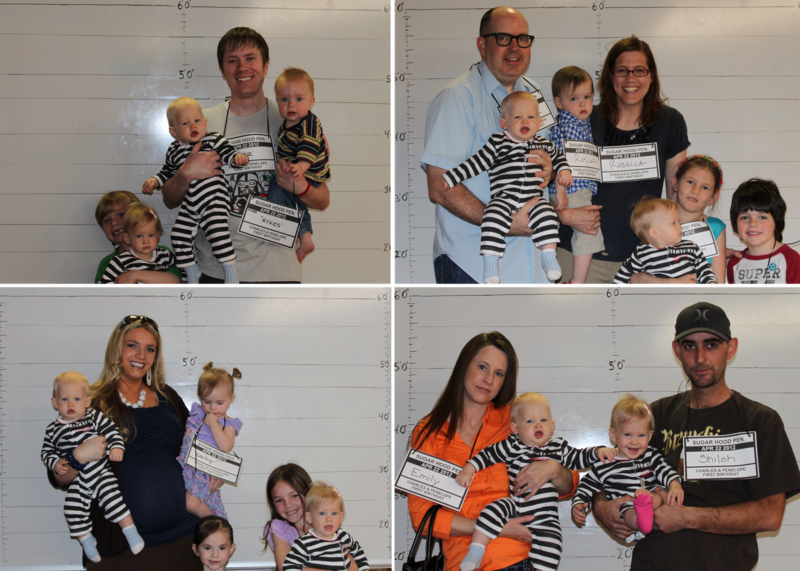 As the guests entered the front door they were immediately booked including donning an ID tag and posing for their mug shots. Our color scheme was black and white with orange and purple accents. 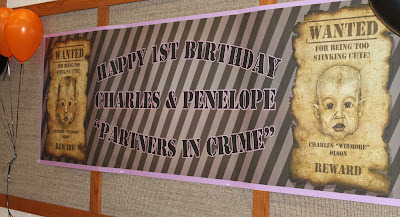 We had a 9 foot banner that was the centerpiece. 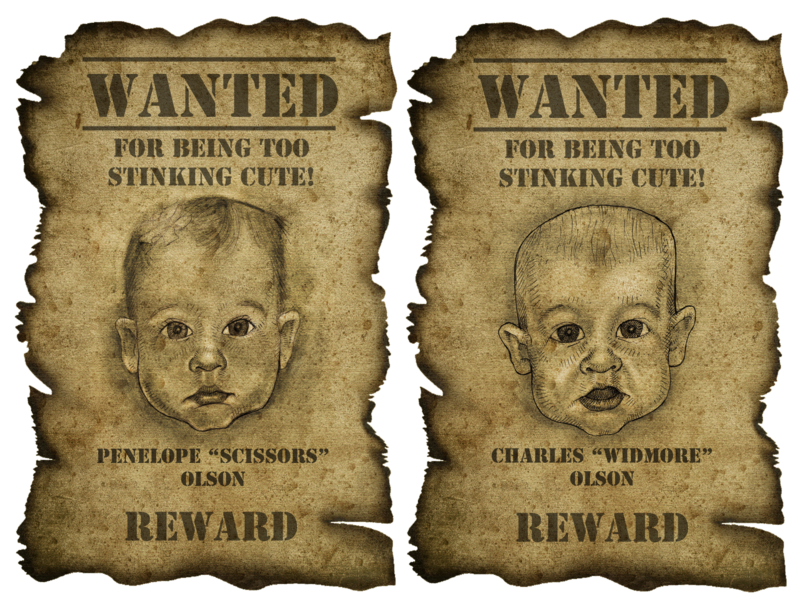 Each end of the banner had an old west WANTED poster that Gabriel sketched, and smaller versions were posted around the room. 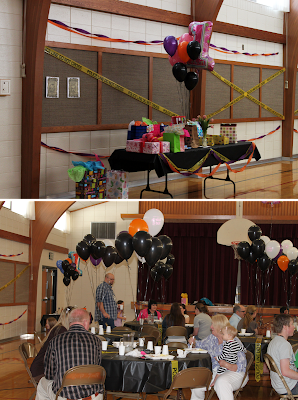 We composed a giant balloon bouquet for each baby, and each table had a smaller centerpiece of balloons weighted down by a rock. The balloons totaled over 100 in all! 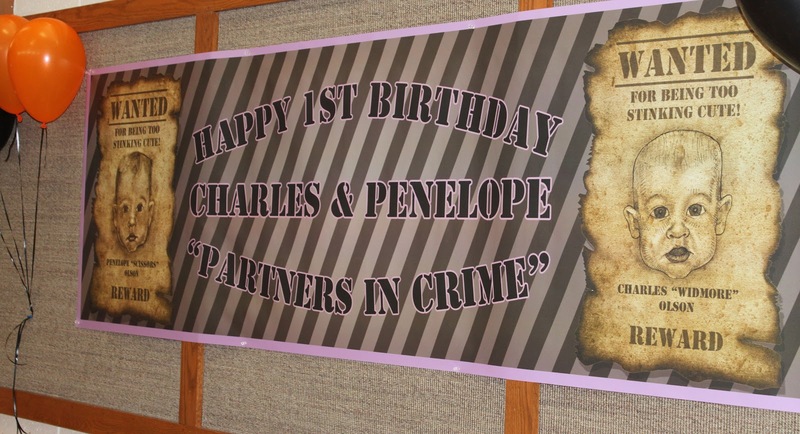 We decorated the room with orange and purple streamers and police tape. Each table was covered in a black tablecloths with white dishes and utensils. We planned two games for the guests to play throughout the party. The first: Escape From Prison. Two guests were tied together with police tape and had to navigate through an obstacle course including passing through the police laundry, the exercise yard of jump ropes and ball weights, and then finally cross the low hanging barbed wire. 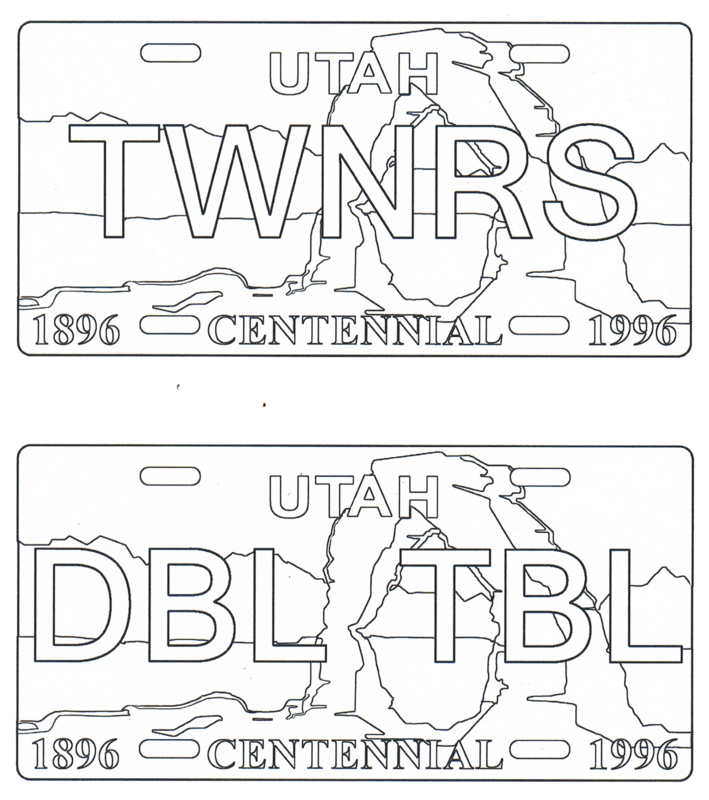 The second game was was more work than play: Color two license plates each. This game came with one rule - complete your quota before you were allowed to have dessert. 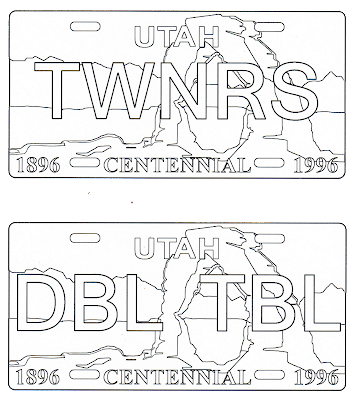 We offered six different plates to choose from: 2 CUTE, 2WINS, DBL TBL, CING 2, TWNRS, and 1-BDAY. Prizes for participating in the games consisted of bubble tape and card games (Go Fish, Old Maid and Slap Jack). 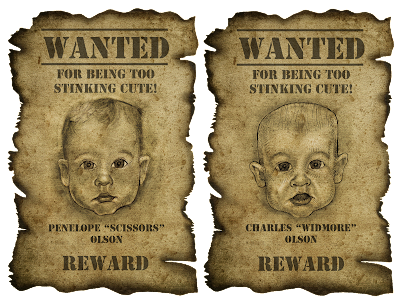 We also issued everyone who attended a goodie bag filled with toy handcuffs, their own personalized WANTED poster, and a sheet of police stickers. 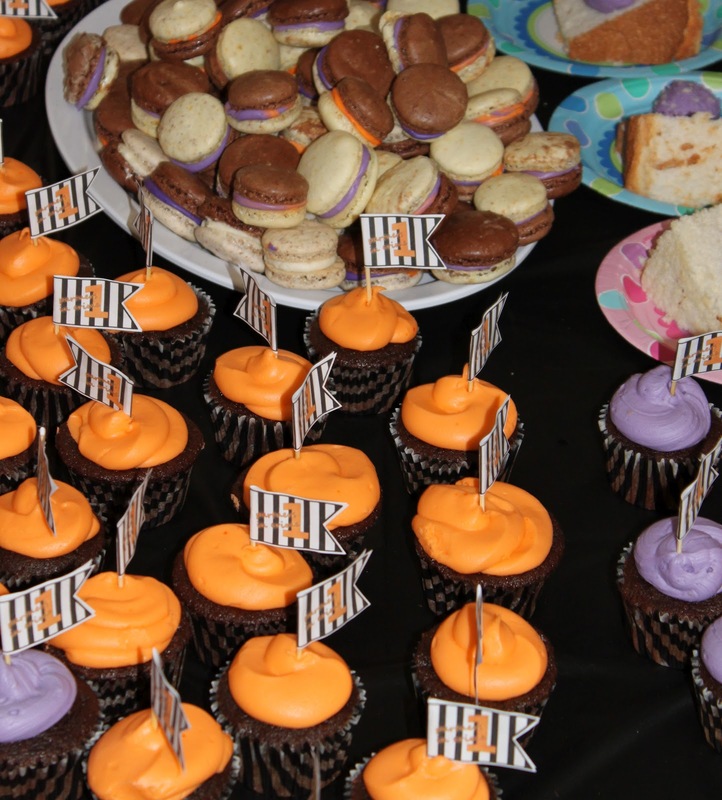 Guests were served Chocolate Orange Cupcakes, Angel Fairy Cake, and Orange and Chocolate Macarons. (For Chocolate Macs replace one tablespoon of the completed mixture with one tablespoon of cocoa; for Orange Macs add one teaspoon of orange zest.) 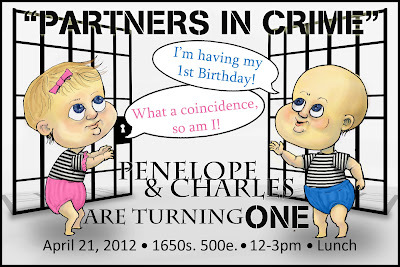 Each cupcake was adorned with a jail striped flag with the theme of the party: Partners in Crime. We went back and forth about whether or not to give the babies a cake for their first birthday, until I came across this fabulous cake on Artistta. With a few additional variations we adapted the cake for our party and the babies were each presented with their own personal cake: sugar free, gluten/grain free, and dairy free. Motherhood is a battle of constant circumspection while attempting to not dwell on the constant failures and moments of weakness. 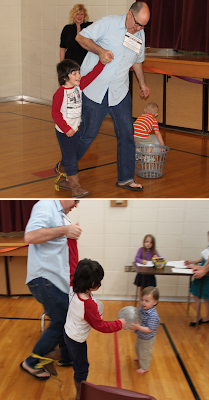 My only goal throughout their lives is to make sure they never go a moment without knowing they are loved.